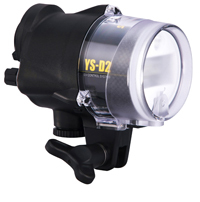 * When the YS-D2 is used with a camera with built-in flash in housing, use the Fiber-Optic Cable. 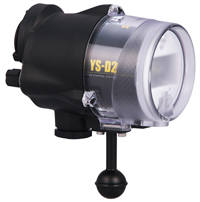 YS-D2 Umima-ru edition will be available as of December 2015. 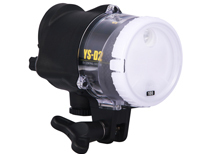 The strobe can be attached to an arm with the YS-mount or the ball-mount (both mounts included as standard accessories). 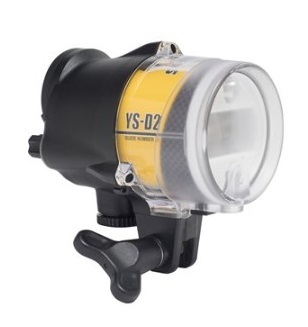 In accordance with the camera and housing you use, choose either a fiber-optic cable (optional) or sync cord (optional) to connect the strobe. * A Fiber-optic cable ll is required to use the DS-TTL ll function.